Black holes are among the most mysterious places in the universe; locations where the very fabric of space and time are warped so badly that not even light can escape from them. According to Einstein’s theory of general relativity, at their center lies a singularity, a place where the mass of many stars is crushed into a volume with exactly zero size. 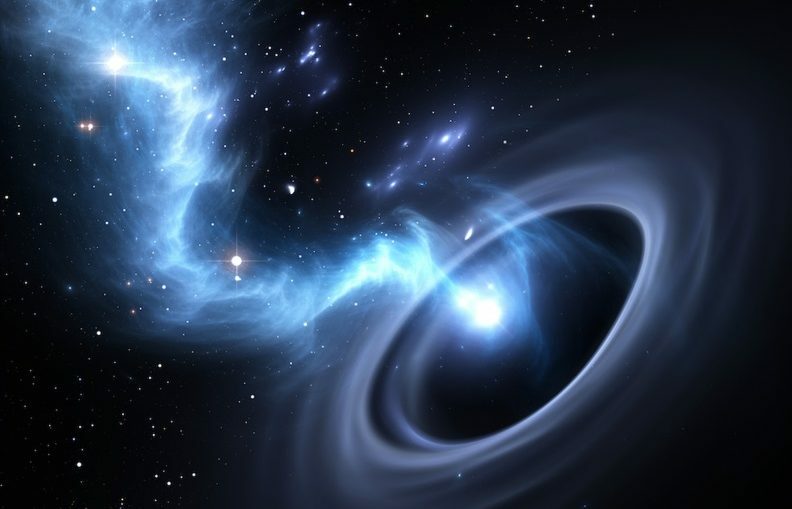 However, two recent physics papers, published on Dec.10 in the journals Physical Review Letters and Physical Review D, respectively, may make scientists reconsider what we think we know about black holes. Black holes might not last forever, and it’s possible that we’ve completely misunderstood their nature and what they look like at the center, according to the papers. Astronomers and physicists have long held that the idea of a singularity simply must be wrong. If an object with mass has no size, then it has infinite density. And, as much as researchers throw around the word “infinity,” infinities of that kind don’t exist in nature. Instead, when you encounter an infinity in a real, physical, science situation, what it really means is that you’ve pushed your mathematics beyond the realm where they apply. You need new math. It’s easy to give a familiar example of this. Newton’s law of gravity says that the strength of the gravitational attraction changes as one over the distance squared between two objects. So if you took a ball located far from Earth, it would experience a certain weight. Then, as you brought it closer to Earth, the weight would increase. Taking that equation to the extreme, as you brought the object near to the center of Earth, it would experience an infinite force. But it doesn’t. Instead, as you bring the object close to the surface of Earth, Newton’s simple law of gravity no longer applies. You have to take into account the actual distribution of Earth’s mass, and this means that you need to use different and more complex equations that predict different behavior. Similarly, while Einstein’s theory of general relativity predicts that a singularity of infinite density exists at the center of black holes, this can’t be true. At very small sizes, a new theory of gravity must come into play. We have a generic name for this new theory: It’s called quantum gravity. The name quantum gravity simply means “gravity at the smallest scales,” but the phrase doesn’t imply a specific theory. However, specific theoretical proposals have been made that would describe gravity as it is in the microcosm. One proposal is called loop quantum gravity. There is perhaps another way to imagine what they are predicting. It is well-known that in strong gravitational fields, time slows down. And black holes contain the strongest gravitational fields in the universe. Because of this, one possible interpretation of this new work is that matter falls into a black hole and then “bounces,” shooting the mass back across the cosmos. Because time is so slow near the center of a black hole, that process simply is taking an enormous amount of time. If the researchers are correct, in the very distant future, where there are now black holes, matter will be erupting, spreading matter throughout the cosmos. As always in theoretical science, there are many interesting and provocative ideas that just aren’t true, and this may be one of them. So it’s important to see if there is experimental support for theoretical ideas like these. There are a few possibilities. Scientists have observed very high energy phenomena in space that have not been completely explained. One is the existence of very high energy cosmic rays that hit Earth’s atmosphere. Another is what are called “fast radio bursts,” which is when a large amount of radio energy is observed in a very short amount of time. Both of those phenomena could, at least in principle, be the signature of a black hole transitioning to a white hole.